The airport spends up to £1.5bn annually with more than 1,400 suppliers from around the UK and there will be more work on the horizon with expansion. Construction of the runway will be the UK’s largest privately-funded infrastructure project and small and medium-sized businesses will be critical to delivering the £14bn investment. 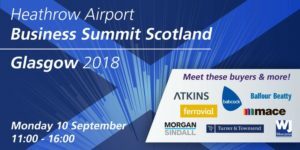 Register today for the opportunity to meet with a range of Heathrow’s suppliers including Britannia Fire Ltd, Beumer Group Ltd, World Duty Free, Babcock Marine (Rosyth) Ltd, Jacobs UK Ltd, Palmers Scaffolding UK Ltd, Turner & Townsend, Atkins, Amalga Ltd, Wilson James, Vanderlande Industries UK Ltd, Ferrovial Agroman Ltd, Mace, Balfour Beatty, Morgan Sindall Construction & Infrastructure Ltd.